pieces are available! Nono, it's OK, I can wait until you're done with all your "Awwwwwws!" 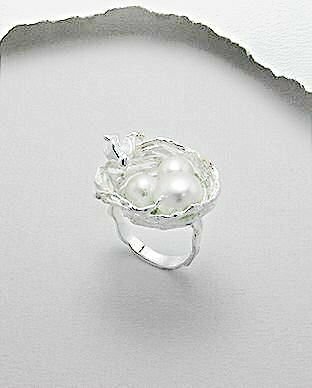 I mean, it's not every day you see a nest made of sterling silver with genuine pearl "eggs" nestled inside and a just-hatched baby chick perched on its edge. I understand that one needs time to soak in all that unbearable cuteness. Hey, I bet you'll be the only one at the next garden club meeting sportin' one of these babies! And I definitely predict another round of "Awwwwwws!" Elements: Sterling silver with a matte .999 fine silver and anti-tarnish finish. Gemstones: Three white 8-9mm genuine freshwater pearls.